Cromwell House on The Bank Highgate Hill, facing Lauderdale House and Waterlow Park, is one of two grade 1 listed buildings in Haringey (the other being Bruce Castle). Apart from its roof and cupola, which were rebuilt following a fire in 1865, it is little changed from 1637-8 when it was built for a prosperous London merchant, Richard Sprignell. At that time it had over 19 acres of grounds, extending over what is now the Archway Road down to approximately the line of Claremont Road. It is distinguished externally by the use of brick rather than lathe and plaster and by the carved brickwork around its windows. Their design resembles the decorative cartouches to be found surrounding information panels on printed maps of about 1600: an indication that the building was probably designed not by a leading architect of the period such as Inigo Jones, but by a builder who was not quite in the vanguard. There are two remarkable interior features. One is the ornate plasterwork ceilings, particularly on the first floor, which contained the largest and most splendid rooms. While extensively restored after fire damage, much of the plasterwork may be original. The design of the ceiling of the principal room, the original great chamber, resembles that of the Banqueting House in Whitehall of 1619-22, with the Sprignell arms at the centre. The second outstanding feature is the grand staircase, its newels embellished with carved statues of soldiers of the time (copies of the originals, most of which were stolen in the early1980s) and the staircase itself with drums, arms and trophies. These were probably meant as a reference to the London militia, or trained bands, of which Sprignell was a proud member. This – and a confusion with John Ireton, the brother of Oliver Cromwell’s favourite son-in-law who briefly lived in Lauderdale House – led the house, in the early 19th century, to gain the name by which it has since been known. In fact, Oliver Cromwell had no connection with the house. In 1675, the house was acquired by Alvaro da Costa, thereby becoming the first Jewish-owned property in England since their expulsion in 1296. Escaping the inquisition, Alvaro, a wealthy merchant, had arrived in England in the suite of Charles II’s wife, Catherine of Braganza, in 1661. He was soon joined by other members of his numerous family, including his cousin and brother-in-law Fernando Mendes, who became the Queen’s physician. Though initially Alvaro and Fernando professed to be Catholic, the popular anti-Catholic fervour of the late 1670s led them to come out openly as Jewish. Cromwell House soon became the suburban residence of the whole, enormous clan, and the house was expanded to meet their needs with a new archway (containing a fireplace with Alvaro’s monogram carved above it) and a rear wing, which has since been partially demolished. After 1700 family members acquired three other large Highgate houses: Englefield House, on Highgate High Street, Moreton House on what is now South Grove and Grove House on the site of Nos.7-12 The Grove. In the early 1720s Daniel Defoe remarked that the Jews had particularly fixed on Highgate as their country retreat, that they lived there in style and had a kosher butcher and a synagogue. It is possible that the synagogue – almost certainly an informal one – was in the ground-floor right room of Cromwell House. It has been suggested that there was a ritual bath or mikveh in the cellar, but there is no clear evidence for this. Perhaps the most distinguished member of the family to live in the house was Catherine da Costa, the wife of Alvaro’s son Anthony and daughter of Fernando. A talented painter of miniatures, she was a correspondent of Voltaire and more than held her own in discussions with him. The family finally sold the house in 1749, by which date the family had integrated fully into English society and married into the Anglican aristocracy. The house has been in institutional use since 1843. First as a school under Gerrit van de Linde, an acclaimed Dutch poet who is buried in Hornsey churchyard. 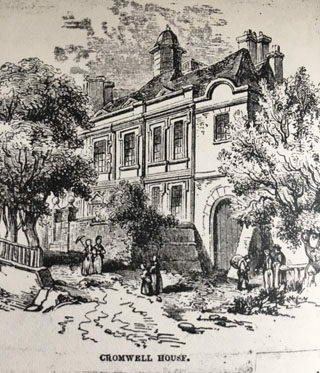 Then, from 1867 a convalescent home for Great Ormond Street Hospital until 1924 when it became a Mothercraft /Truby King children’s home, closed in 1951. It was then owned successively by Protestant and Catholic missionary orders, whose unworldly members were perhaps not the best guardians of such a historic house. It was in a dilapidated condition by the early 1980s when, largely as a result of community, it was restored and sensitively modernized between 1983 and 1989. Since then it has been the High Commission of Ghana and although closed to the public, Historic England has the right to make occasional inspections.